It couldn’t be a better time to Rev Up Your Research with a ScanPro All-In-One™ from e-ImageData and Stars Information Solutions. 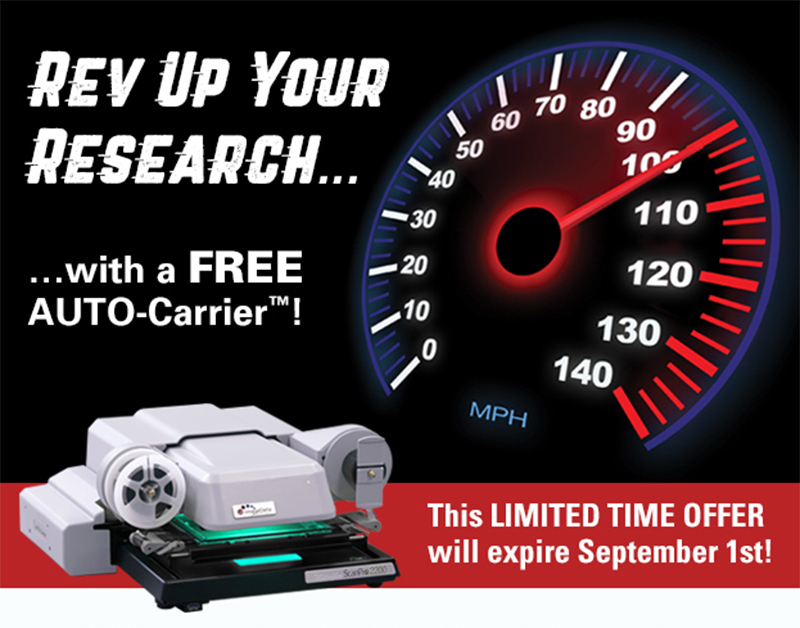 Between June 1st, 2018 and September 1st, 2018, you will receive a FREE AUTO-Carrier with your purchase of any current ScanPro model*. Free AUTO-Carrier (AC) – Anytime an AC is provided (purchased or no charge), the first year annual software subscription fee is included at no charge. Free 90-day trial of AUTO-Scan® Pro – Allows you to scan fiche and roll film at 100 images per minute. Without AUTO-Scan Pro, the ScanPro reverts to the AUTO-Scan software which scans 20 images per minute for both fiche and roll film. The ScanPro All-In-One™ is the first and only truly universal microfilm scanner for on-demand, conversion scanning. Experience the best of both worlds with this limited time offer!